Junior Research Fellow Vacancy – Last Date 22 April 2019 (Dibrugarh, Assam), Dibrugarh University recruits Project Assistant Post. Candidates with M.Sc., NET qualified experienced can apply. 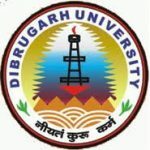 Project Assistant Vacancy – Last Date 08 April 2019 (Dibrugarh, Assam), Dibrugarh University recruits Project Assistant Post. Candidates with B.Tech / Diploma experienced can apply. Interested candidate may send his/her application via e-mail along with updated bio-data (including e-mail id and phone number) to the address mentioned below latest by 22nd March, 2019. Only shortlisted candidates will be called for the interview. No TA/DA will be paid for attending the interview. Junior Research Fellow / Project Assistant Vacancy – Last Date 22 March 2019 (Dibrugarh, Assam), Dibrugarh University recruits Junior Research Fellow / Project Assistant Post. Candidates with M.Sc. , NET/GATE qualified experienced can apply. I have successfully completed my 10th standard.. Now looking for a suitable job..